Equipped with personal entertainment devices, the patient rooms feel more like home. These devices offer a way for patients and their families to access patient education and entertainment options as they heal. President/CEO Deb Feldman often says, “We’re thinking about the child and the parent” and this technology setup delivers comfort unlike other methods today. 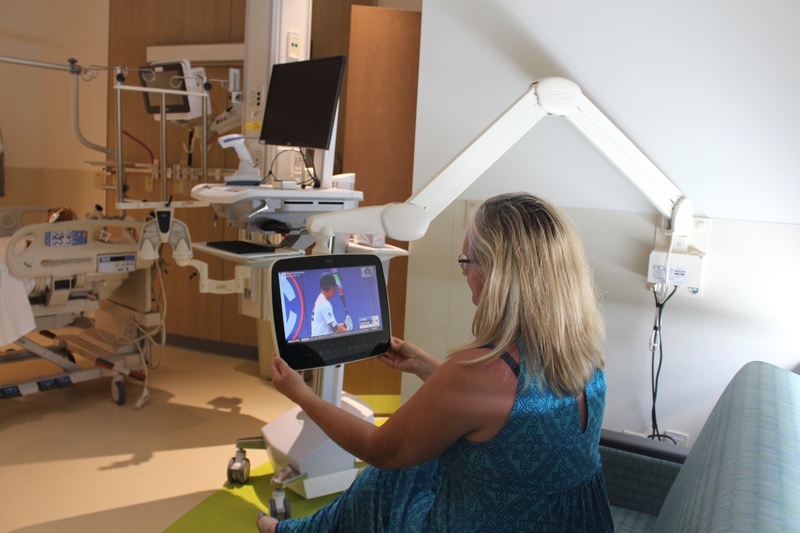 There are about 100 arm-mounted 14” personal TVs in some wings, and in others there are arm-mounted systems with the interactive patient system by Getwell Network. Mounted near the headwall, the swing-arm allows a wide range of motion for patients and guests to comfortably interact with the device. The coax cable and all other necessary cables are inside the arm, keeping the device continuously charged and the room safe for everyone to enjoy. Arm-mounted technology allows the entertainment device to be flexible for the user. The device can swing over cribs of young patients to play soothing programming. Family members can turn it away to entertain themselves with less noise and light while the patient rests. Quality is not sacrificed with a smaller device either. In fact, a 14” arm-mounted TV-tablet at a comfortable distance has the same viewing experience as a 90” wall television across the room. These arm systems and TV-tablets are even manufactured in the greater Dayton area. PDi Communication Systems, Inc. creates UL-Listed, healthcare-grade TVs, interactive TV-tablets, swing-arms, low-voltage power supplies and more. Made by people who care in Springboro, OH, PDi products are built to last. PDi devices are specialized for healthcare with anti-microbial coatings for infection control and are UL listed for hospital use. The new patient tower at Dayton Children’s Hospital was built with the commitment to support the local community. The vast majority of the money spent on construction and furnishing was sourced near Dayton, "the birthplace of aviation." PDi is proud to be a local contributor to an innovative hospital serving the Dayton Ohio area. Learn more about PDi healthcare-grade technology options here.